Text and Logo is etched (engraved) into metal (in this case shiny finish stainless steel). The etched colour is due to removal of the surface metal to expose the metal beneath. As the metal beneath is the same but no longer mirror finished, its matt texture gives it its whitish colour in contrast to the shiny background. W here the customer needs colours in the tag or sign, it is possible to etch deeper and then fill colours into the grooves. For the tag with numbers, hairlined stainless steel was used. The tag was used as to show the apartment unit number on a letterbox. Going yet deeper into the metal we will in effect cut through the metal. 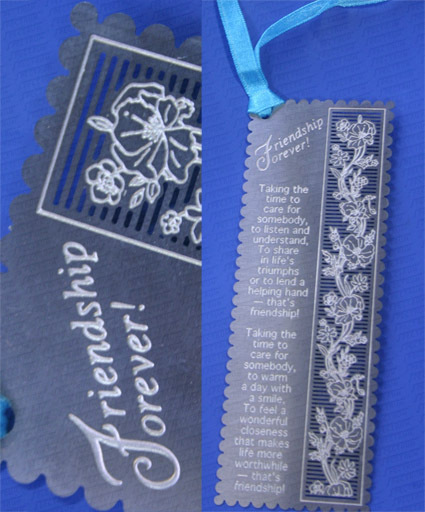 The stainless steel bookmark example is to show a mix of etch & cut through.